A spring 2015 rendering showing Monument Realty's new One M Street office building, designed by HOK and slated to be the new headquarters for the National Association of Broadcasters when it is completed in 2019. The top two floors will be a conference center, and boast unobstructed views of the US Capitol and Washington's downtown core, at least for now. 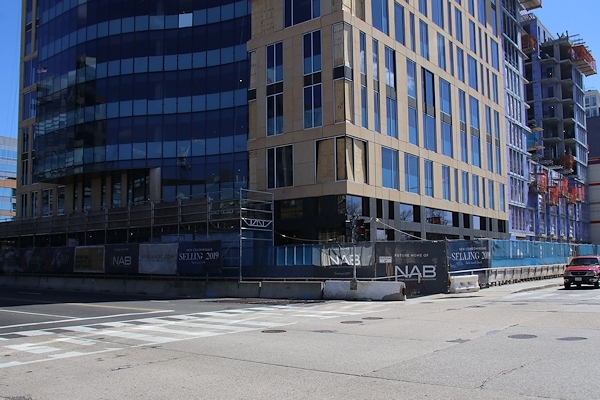 March 17, 2019 - The NAB HQ construction, now towering over the southwest corner of South Capitol and M, with its sibling residential building Avidian far along as well. March 17, 2019 - The east side of both buildings, facing, Van, as seen from M Street. This major entryway to the neighborhood has been quiet since the Domino's closed back in the mid-2000s, but that is now changing. May 20, 2006 - Looking north on South Capitol Street toward M Street back in the old days. Jan. 5, 2019 - The same location, a little different. February 28, 2016 - Intentions announced at Van and M.
Looking down South Capitol Street from M, showing the southern portion of the NAB HQ and 10 Van. NAB HQ will have about 4,800 square feet of retail, facing M Street and South Capitol Street. This is a ground-level view of the building as seen from South Capitol, looking east on M, with the corner retail space at right. There will also be 127 parking spaces in three underground levels. From an April 2015 zoning filing. 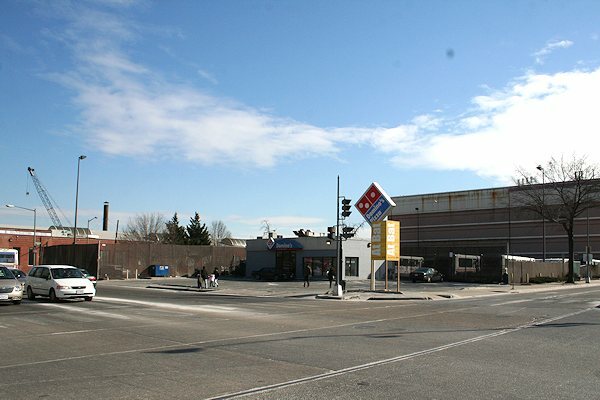 March 17, 2019 - The same location, with Domino's long since demolished. Originally Monument proposed a 328,000-sq-ft office building for the site, seen here in a design submitted to the Zoning Commission in 2012.